Martin has written about the new car, which forms part of our fleet of transport mechanisms. But Turty is mostly intended for the movement of children (plus sundry light haulage). I’d like to spend a little time talking about my commute vehicle. I’ve always had blue bikes, for some reason, since the first banana-seat cycle with the coaster brakes. Since the age of 10, I’ve always had multi-speed bikes with rams-horn handlebars; this is my third and best of the line: a Dawes Horizon bottom of the line touring bike (heavier and stronger than a road bike or racing bike). It’s a nervy, responsive thing, though maybe just a little short in the frame for me. I bought it in Edinburgh, about a year ago, in the hopes that I would be able to ride it during the brief Caledonian summer. I used it about five times before fear of the homicidal Scottish drivers caused me to stop. It was quirky and bizzare in Scotland, where pseudo moutain bikes are all the rage. It’s even more outré here, where the classic Dutch granny bike rules the roads, with its upright riding position and its near-immortal construction. Unfortunately, it’s also a target for theft, since it’s what the bike shops here call a “sport bike”. And bike theft is a national phenomenon – all my colleagues have stolen bike stories. I’ve guarded against thieves with a few strategies. 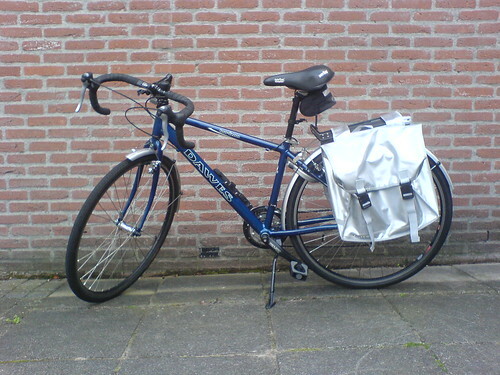 First off, those large and ugly silver panniers really do ruin its sleek lines, so it doesn’t look so appealing. Also, I’ve added a Dutch wheel lock. These things are practically indestructible, and it’s positioned so even cutting the cable ties won’t allow you to get the back wheel off while it’s present. 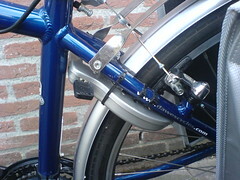 But most importantly, though I always double lock it (with a cable through the front wheel and frame and through something fixed; the Dutch have bike racks everywhere) or treble-lock it (another wheel lock, loose, through the back spokes and the frame), my main defense is geography. It does not go into high-theft areas such as central Amsterdam. And where possible, I park it among many bikes, because the best place to hide a leaf is in a forest. Naturally, I also have reflectors, lights and a bell. I keep a spare inner tube and a set of tyre tools in the bags, and have already done one roadside swap. This weekend, I’m going to buy tyres with reflective stripes around them – both because they are required by Dutch law, and because they really are safer. I’ve really enjoyed my commutes by cycle, even in the rain. The endorphins mean that I arrive at my destination glowing a little, no matter how challenging the day. 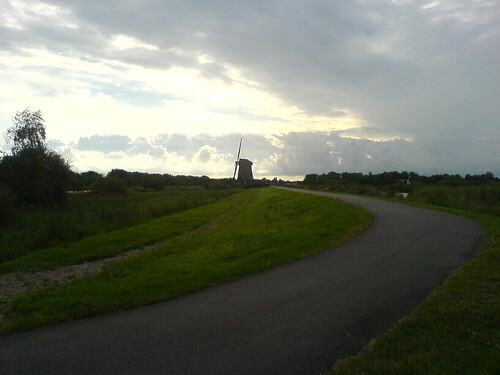 And if I have a little extra time (25 minutes instead of 15), I take the route that runs through the Twiske, the local recreation area. In short, I love my bike. 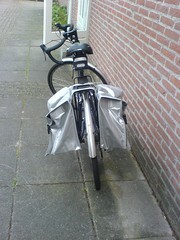 I love working on it, commuting with it, shopping on it (the panniers can hold a lot of groceries). I might start calling it Vera. Finally catching up. I like Vera. Can one get those rear wheel locks in the states anywhere? I’d love to have one for Maia. They’re called ring locks, or O-locks, but I’m not seeing any online in the US. I’d suggest going to a bike shop (if you get the chance) while you’re in Germany.